Danes observing the Scottish independence debate must be alarmed to discover that, according to British conventional wisdom, their country (population 5.5 million v Scotland’s 5.3 million) is not a viable independent state. It would seem, according to this debate, the Danish Krone is economically impossible and should not even exist. use Sterling anyway without any formal agreement with Westminster. What happened to the possibility of a Scottish Pound? NEF has no position on Scottish independence – this is a choice for the Scottish people – but we do believe that an independent Scottish economy could flourish in a multi-currency world. It would be an opportunity to lead the world in demonstrating in practice a robust 21st Century multi-currency system more in keeping with emerging innovations in digital money and diverse payment systems. Scotland, like the rest of the UK, does not need Sterling. It would do better with a range of currencies to suit different needs rather than seeking to maintain a currency monoculture. As well as a national currency there could be currencies that promote SME businesses, strengthen local communities, or encourage positive environmental behaviour. What might this look like in practice? 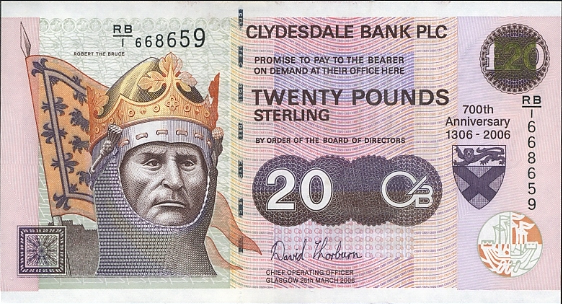 Moving away from Sterling, Scotland would need to create a new currency designated as legal tender. Importantly it should be created debt-free by the Scottish Government, unlike all other national currencies which are principally created when commercial banks make loans. This would implement a monetary reform first proposed by American economists in the 1930’s in response to the 1929 financial crisis, and recently concluded to be hugely economically beneficial by an IMF research paper (PDF). Key benefits include significant reductions in public and private debt, reduction in general taxation levels, greater economic stability and the complete elimination of bank runs. This blog post cannot fully cover the pros and cons of Sovereign Money and Full-Reserve Banking proposals, but even if Scotland were to introduce a new bank-created currency that mirrors the existing UK monetary system, it would still benefit from having a diverse multi-currency system. The creation of a new Scottish currency might be seen as a potential problem for multi-national businesses located in Scotland. However the reality is that such businesses already operate in multiple currencies and have the ability to hedge currency risk. Any additional complexity in paying local suppliers and employees in a local currency doesn’t seem to trouble Danish global corporations such as Maersk, Vestas and Lego. In addition to reforming the national currency, Scotland’s SME’s would benefit from a Scottish version of the Swiss WIR – a scheme that allows SMEs to trade with each other without using cash of any description. This currency system has over 77000 SME business members and about 1.5 billion Euro equivalent is traded through the system every year. There is evidence (PDF) that the currency operates counter-cyclically to the Swiss Franc, smoothing the boom and bust cycle for Swiss SMEs. We’re working with a currency about to launch in Nantes, France, that uses a modification of the WIR model that also allows individuals to participate by paying for goods and services with their ‘SoNantes’ card. There are already smaller versions of this in Scotland, such as ‘The Business Exchange’ which could be supported and expanded. To complete the multi-currency model there should be the bottom up creation of a range of smaller, community based and geographically focused currencies. These would comprise Local Exchange Trading Systems, Timebanks and local or transition currencies. These have shown great promise in revitalising local economies that are struggling and creating new social bonds between businesses and residents. The debate on Scottish currency should move beyond ‘yes or no’ – Scotland does not need Sterling and would flourish by embracing a modern multi-currency ecosystem, regardless of the outcome next month. This article was first published by New Economics Foundation here. Interesting they mention Switzerland as all the shops there also deal in Euros, you can pay with Swiss Franc or Euro in every shop, all the tills are set up to accept both and change can be given in either as exchange rates are automatically shown. I think that may a great option for Scotland, the Pound and the Euro used in conjunction.